First there was the letter addressed to The Viscountess Ashton. Then there was someone calling Philip's name at the zoo. Then there was Philip's journal placed on her desk. A man on the boat to Greece looked just like Philip. At the Acropolis someone in the dark called out té kallisté, something only Philip would do. By the time she arrived at the villa in Santorini Emily was well prepared for the impossible, the return of her first husband Philip, the Viscount Ashton. Never mind that he died over a decade ago, she would recognize those piercing blue eyes anywhere, though his nose does look a little different. Emily had concocted this trip to Greece as a way to distract her dearest friend Jeremy from the heartbreak and attempted murder at the hands of his fiance, Amity Wells. Little did she know it would prove such a distraction with her first husband back from the dead! Jeremy takes it in stride, it's just another blow to him ever winning Emily, before he had just the one husband to contend with, now there are two! As for Emily's second husband Colin, he is almost more shell-shocked than she. Here is his dearest friend in all the world returned to him and he has betrayed him by marrying Emily, the love of both of their lives. There are so many ramifications. Is Colin and Emily's marriage valid? What about the legitimacy of their two children? Is the villa even Emily's? And the guilt! But none of that matters because Philip has arrived with a shadow looming over him. Philip insists that after learning of Emily and Colin being happily married that he vowed he would never intrude on their new life together. He has in fact built a new life for himself. Without the largess that came with his title he has had to earn a living and has become a rather decent archeologist. A job he has come to love. In fact he's been working on a site on Santorini for the past few years. He says that his not coming to Emily sooner, despite their proximity, proves his honorable intentions. The only reason he has appeared now is that his fellow archeologist was injured during a storm the night before Emily's arrival and the only place he could think to take him to get medical attention was the villa. Sadly his friend died and Philip's secret has been revealed. Though the inhabitants of the villa soon learn that it is not the only secret Philip has. There are some shady men following Philip and soon he reveals a story that is almost more incredible then his survival in Africa after everyone presumed him dead. Years earlier at a dig near the remains of Troy he found what he believes to be part of Achilles's helmet. The local working with Philip stole it and turned up dead the next day. Ever since then a crooked dealer in antiquities, Demir, has been following and harassing Philip. Demir and his Turkish henchmen have arrived on the island and Philip's life is in danger. Only Emily isn't sure she buys the story. If this is Philip he would never have let anything connected to Achilles out of his sight... Is it possible to put her guilt aside and find out the truth? 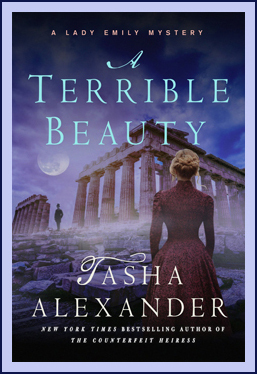 A Terrible Beauty is almost like a reset on the Lady Emily series. We're going back to the beginning, back to And Only to Deceive and seeing everything from a different angle. This isn't just "Philip's" story and his perspective on events but also another side to the world of antiquities. Emily reading Philip's journals after his death led to her becoming not just a Greek scholar but a lover of the antiquities that her late husband collected. This is the cornerstone to Emily's journey of discovering and the life and collection she builds over the years. Yet for all her love of antiquities we the readers have only seen certain aspects of this one word that encompasses so much. Antiquities covers the history, the excavation, the cataloging, the restoring, the purchasing, the forging, the collecting, the exhibiting, so many things under one banner. For all her talk of ruins and walking the remains of Troy this is the first book in which Emily's story takes us truly beyond the confines of the museum and the country houses and we get to see an excavation. Oh, and the archaeological sites we see through "Philip's" journey, I felt that at times I was reading an Elizabeth Peters novel about the exploits of Amelia Peabody. But what I found fascinating is that the archaeological work makes sense in regards to Philip's personality. He always relished the hunt, be it on safari or dealing with antiquities brokers, and here he is digging through the very earth in search of buried treasure. This is why I wanted to be an archeologist for about a hot minute, the buried treasure. But my true love was in making art and no matter how many art history or anthropology courses I took this would never change. Though to truly understand art you need to understand it's history, which is why I took so many art history courses. A Terrible Beauty, besides throwing us back to the beginning of Emily's story took me on a bit of a time warp as well. I was having all these feelings about my first semester in college. SO many things combined to make me oddly nostalgic. One of my friends decided to go back to school and hearing her talk about midterms and finals is giving me all the feels. And with Thanksgiving I was dwelling on how I used that small respite from going to class to catch up on school work, even going so far as to be the odd one out at family gatherings sitting in a corner with flashcards drilling dates for the upcoming finals. Also this fall has been exceedingly cold and one thing that stuck with me from undergrad is that I was always constantly cold. No matter how many layers I put on the Wisconsin weather would defy it. It was twenty-one years ago that I took my first art history course that covered the ancient to medieval world, therefore covering both Greece and Rome. So when Emily was at the Acropolis I was giddy because I knew this! I somehow STILL knew this! It was locked away in the fog of time and cold and flashcards and yet it came back in an instant. So A Terrible Beauty ended up not being just about Emily dealing with all these emotions and her past but in me going through the same experience on an entirely different level. This book became very personal to me and had me thinking about days gone by. In thinking about your own past, if you're one to overthink things, you start to think about the greater world, and as we're dealing with Emily, the history of ancient civilizations. What I'm getting at is specifically about the art we have left over from these civilizations. The gorgeous white marble statues and ruins that still thankfully stand. Yet in a bizarre coincidence The New Yorker just published an article on the fact that the art we look at and admire is nothing like what those in ancient Greece or Rome admired. Because all statuary, buildings, what-have-you, they were fully painted. Emily actually makes a reference to this when talking to Jeremy at the Acropolis and I was all, I JUST READ AN ARTICLE ON THAT! Yes, I know Emily and Jeremy couldn't hear me, but I just found it such a random coincidence that I couldn't not comment to fictional characters in a book who can't hear me. If you click on the link to the article you'll see what some of the most famous sculptures might have looked like and it's jarring. We are so used to "The Myth of Whiteness in Classical Sculpture" that to see marble covered in kind of cartoony paint makes you realize that sometimes an unfinished look has much more elegance. And now I'm thinking about naked cakes. Thanks Great British Bake Off. With all this dwelling on the past I find it interesting that all those years ago and even just this past spring when I re-read And Only to Deceive I was 100% firmly in the camp of wanting Philip to somehow be alive. Yes, there would be problems to solve, so many problems, and perhaps Emily would no longer be the wife he had married, but I was sure they would work it out if only he wasn't dead. And here he is! Not dead! And while I would have given anything for Philip to return ten books ago now I was all go away foul demon back to the hell which spawned you! I am under no circumstance going to address the is he/isn't he actually Philip here because, spoilers people, but I am totally going to talk about how his reappearance made me feel, and that was not good. It's interesting how one changes over time. I have been on a long journey with Emily and Colin, going through all their ups and downs and heartbreaks. I've seen them fall in love, fight, make up, get married, and have children. I've witnessed how they have found a balance to working together, relying on each others skills and instincts, knowing when to step aside and knowing when to step in. They have this life they have built together and one person could bring it crashing down. This isn't like now when a divorce and re-marriage could solve things, there's the fact that women were viewed as property and a legitimate heir was needed. Therefore I say this once again, Philip begone! My not feeling good about Philip's reappearance is nothing to how Emily and Colin feel! Not just the fact that their lives are crashing down around them, but the fact that they feel their guilt anew. During their courtship I don't think I'd ever really thought about how their falling in love must feel. They have always been perfect for each other so after Philip shuffled off this mortal coil it was only natural that they would be thrown together. They are, in my mind, relationship goals. They perfectly compliment each other and are so in love. Yet their love came at a cost; Philip's life. Philip being dead meant they and I didn't over-analyze the fact that Colin was Philip's best friend and Emily was his wife. They both cared for him but in the end his death lead to their happily ever after. Yet in A Terrible Beauty they have to face this fact all over again. And they aren't dealing with nebulous ideas of what Philip would think from beyond the grave, here he is at their villa staring them down across the sitting room and they feel instant shame. How could they have done this to Philip's memory? How could they find love and happiness out of his demise? How could they have not known he was alive all these years living a harsh life while they lived in connubial bliss? This guilt and shame hang over Emily and Colin like a dark cloud. The fact that to their faces Philip is being so magnanimous makes it even worse. How can they be forgiven? Or will the guilt stay long after Philip is gone from their lives one way or another? Perhaps the answer lies in Death in St. Petersburg!